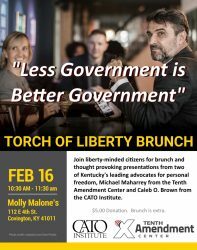 Please join Libertarians of Kentucky’s 4th District for the first ever “Torch of Liberty Brunch”. This special brunch will feature speakers Michael Maharrey, Tenth Amendment Center and Caleb O. Brown, CATO Institute. The District 4 Annual Convention will follow shortly after the brunch. Michael Maharrey serves as the national communications director for the Tenth Amendment Center. He’s the author of three books on nullification and hosts “Thoughts from Maharrey Head” podcast. Michael is a journalist by training and lives in Lexington, Kentucky. Caleb O. Brown is the director of multimedia at the Cato Institute, where he has hosted the Cato Daily Podcast and CatoAudio since 2008. Before coming to Cato, Caleb was a reporter at WHAS AM in Louisville, and he directed the KentuckyVotes.org project for the Bluegrass Institute. Minimum donation of $5 to attend both presentations. Donations will cover speakers’ expenses. You may order brunch from the Molly Malone’s menu at your own expense.